This will be a Live and Online simulcast auction All items must be removed by Thursday Nov 15 2018. No items will be removed until full settlement been made. Everything will be sold As-Is Where-Is; without guarantee or warranty expressed or implied. Items become the sole responsibility of purchaser. All sales are final! BIDDER CONTRACT: In order to bid at this auction you must meet registration requirements. By registering and obtaining a bidders number you are demonstrating that you fully understand, accept and agree to all conditions and terms set forth for this auction, whether in writing or implied verbally. BUYER RESPONSIBILITY: From the moment auctioneer deems items sold, it becomes the sole responsibility of buyer. Reasonable care will be made by auction company to safeguard purchases, but in the event of theft, vandalism, accidental, or purposeful damage, negligence and/or and Act of God, Buyer agrees to hold auction company harmless. WARRANTY: All information contained herein is true and correct to the best of auction company's knowledge, but it is in no way guaranteed as to the accuracy of description made. Every items sold 'as is where is' without warranty as to usefulness or merchantability. Bidder/Buyer has opportunity during inspection days prior to auction to inspect or have inspected by third party all items contained in this auction. EK AUCTIONEERS,LLC. and its Employees act merely as agents for sellers. All auctions are with reserve unless specifically stated otherwise. Reserves, if any, ARE NOT disclosed unless advertised as 'ABSOLUTE.' Auctioneers at their discretion may place a reserve bid on behalf of the seller. All final bids are subject to the seller's confirmation. Only the top bidder will be contacted as to the status of his/her bid. While the information we provide on item(s) is deemed correct, no warranties are expressed or implied as to any items being sold and you agree to purchase and accept the item in an as-is condition. Information on items is obtained by us from the sellers and you hereby agree to hold harmless EK AUCTIONEERS, LLC and their Employees for any errors or omissions regarding the item(s) being sold. This information includes but is not limited to year, model, machine or engine hours, physical condition, options, features and other data pertinent to the value of the item. ALL ITEMS ARE SOLD AS-IS WHERE-IS unless specific factory or seller issued warranties are listed in the item description. You acknowledge that you have the right and responsibility to inspect the item(s) personally, or to have a third party representative inspect the item(s) for you. That by bidding on an item you have agreed to accept that item in its present condition at its present location and with the description provided whether accurate or not. Timed Online only Auction Close. Timed online auctions will begin to close on the date and time listed. Lots will remain open until no bids have been placed within the last 2 minutes. Timed online auctions normally close at a rate of one lot per minute. EK AUCTIONEERS,LLC reserves the right to close multiple lots per minute at their discretion. Upon your accepted bid of an item, that item shall immediately become your responsibility and be at your risk (whether you have paid for that item or not). You agree that EK AUCTIONEERS,LLC . its employees, and their sellers are not responsible for lost, stolen or damaged items and will not reimburse or discount items for any type of loss. Buyers are responsible for any costs incurred to prepare their item(s) for transport and/or shipping. This includes but is not necessarily limited to the cost of any rigging, disassembly, special loading requirements, transport, packaging, insurance and all other costs related to physical transfer of their item(s). You agree to remit payment and remove from the auction property any purchases within the stated time for the auction being conducted. You further understand and agree that failure to remove items in the stated time for the auction will subject you to moving and storage fees unless arrangements have been made with the seller. When using our online auction services you are making firm commitments to purchase said item(s) and are entering into a legal and binding contract. Bids may not be cancelled or retracted for any reason. Non paying bidders or fraudulent bidding will subject you to legal recourse and possible criminal charges including any fraud and/or interstate commerce violations. You also acknowledge that the Internet may be an unreliable and error prone network. EK AUCTIONEERS,LLC will not guarantee that bids placed online will always be transmitted to or received by the auctioneer in a timely fashion. You agree to hold EK AUCTIONEERS,LLC and their employees harmless for any interruptions in online bidding. Further, the auctioneer has the sole discretion to accept or refuse any bid. EK AUCTIONEERS,LLC retain the right, at our sole discretion, to add, delete or change some or all of our online services and the terms and conditions governing their online auctions at any time without notice. ABANDONMENT POLICY EK AUCTIONEERS, LLC provides this Abandonment Policy to inform you of our policies and procedures regarding any purchased item(s)/property that has not been removed by a buyer in a timely manner. Upon winning the bid for an item(s), after paying for item(s) purchased, a buyer is obligated to remove the item(s) from the auction site within a timely manner. 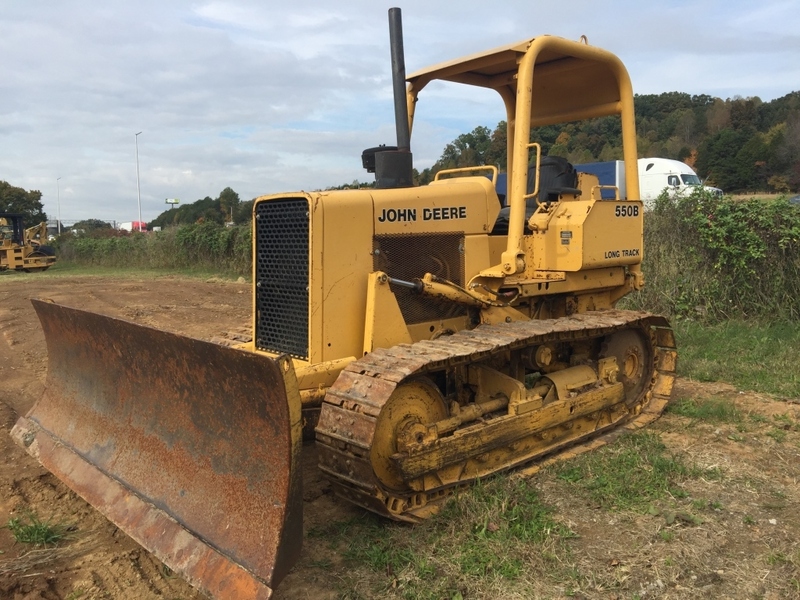 EK AUCTIONEERS,LLC may deem a buyer's failure to claim and remove equipment within 60 days following the close of an auction as evidence of buyer's intention to abandon the property. In these instances, EK Auctioneers,LLC may take action that is adverse to buyer's interest in the property, including, but not limited to steps to dispose of the property. Disposition of property may include a variety of approaches based upon the buyer's purchase price of the property as follows: 1) For those items with a final selling price of $5,000 or less, EK AUCTIONEERS,LLC will determine the appropriate disposition approach which may include: a. Removing and disposing as the company sees fit. b. Allowing seller to retain or scrap. c. Sell the item(s), whereby EK Auctioneers,LLC will remit the sales proceeds to the buyer, less selling and advertising expenses, storage costs, plus 20% administrative fee. 2) For those items with a final selling price of greater than $5,000, EK AUCTIONEERS,LLC may remove the item from the selling location and resolve as follows: a. EK Auctioneers,LLC may reimburse the seller on the buyer's behalf for storage fees of $25 per day, with the total amount not to exceed $1,500. b. Sell the item(s), whereby EK AUCTIONEERS,LLC will remit the sales proceeds to the buyer, less selling and advertising expenses, storage costs, plus 20% administrative fee. If a buyer has not removed the purchased item(s) from selling location within 8 business days after the close of the auction with the winning bid, the buyer will be responsible for directly paying the seller any and all storage fees if levied by the seller. If levied by the seller, storage fees will be $25 per day beginning the 10th day after the close of the auction/winning bid. All information contained in descriptions in catalog and Internet are made with auction company's knowledge and information, but are not guaranteed. Bidder/Buyer assumes all responsibility to determine the correct information, including but not limited to kind, age, year, model condition, make, serial number, etc. No sale shall be invalidated by inaccuracies, defects, damaged goods, or incorrect descriptions. BY SIGNING INTO THIS AUCTION YOU AGREE TO ALL TERMS & CONDITIONS OF THIS AUCTION.